This shade hack idea came about as a final step in my bathroom make-over.My project was completed, but I still had a window that needed treatment. It is a small casement window, only 21 1/2 inches across on the inside. I had read on a blog that one person used fabric glue to cover a plastic pull-down shade. But I already had a shower curtain that had a busy pattern. I didn’t want to introduce more busy. In fact I had two curtains. Originally, I envisioned using two curtains on my shower and have them meet in the middle. I had received one for my birthday in July and ordered another one when finally getting around to doing the make-over. Oops…not a good move. They were slightly different colors. I couldn’t return one without paying shipping so I ended up with another curtain in reserve. It was around $13, I think, so I didn’t have a large amount of money invested in it. I kept staring at the curtain wondering how I could use it (or parts of it) and then thought….if you could use fabric glue on a large piece of fabric over a plastic shower curtain, why not use just parts of it. So, that’s what I did. I knew that since the shower curtain was 100% polyester, it wouldn’t ravel much, so I found a couple of gray flowers and cut them out. Then I glued those babies on my $8 Lowe’s shade I had cut to fit at the store and presto, I had a hack that I kind of like. 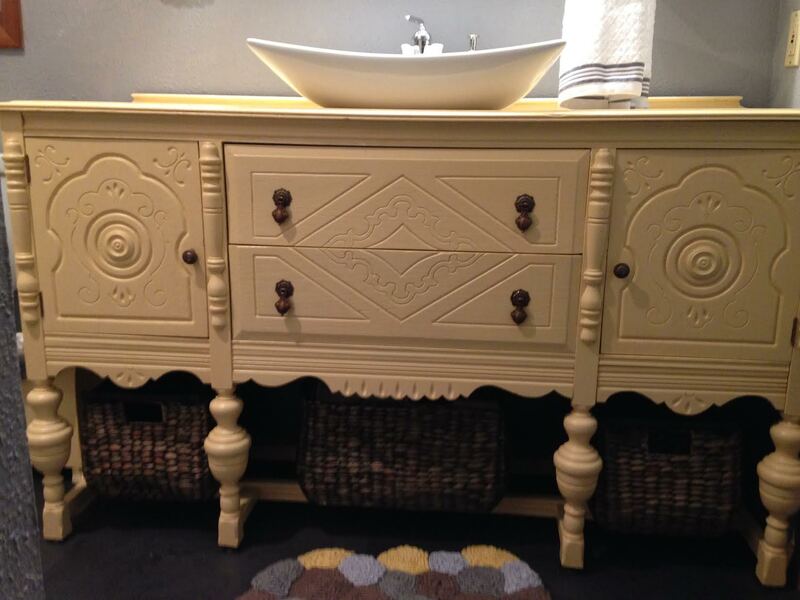 It is different, not busy, cost around $21 total (I already had fabric glue) and it ties my gray, white, and yellow bathroom all together. 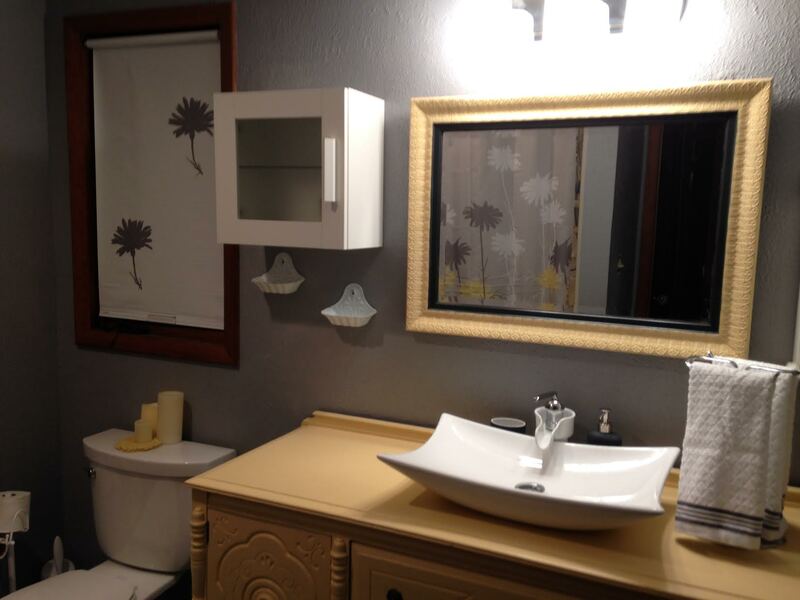 You can click on this link to see how my bathroom make-over came about but here’s a peek at the completed project. Sorry about the lighting.